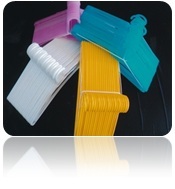 High quality, strong & flexible plastic hangers. Ideal sized for all adult clothes. Packs of 20's. More information on our CLOTHING HANGERS Fundraising project upon request - please complete the form below.